the color is perfect for Liss! yer a good friend…and seamstress. That is so cute! Makes me want to cook more. I love this blog! You never cease to impress me with your talent. Way cute!! Who was your model?? I definitely think we should do this in sewing group. The model (and photographer) was Alissa. She’s the one that took the super cute pictures above my piano. I have some pretty talented friends. It’s starting to make me wonder why YOU are both friends with ME, though. It looks fabulous! If I buy a house will you make one for me? Even though you don’t even know me? It’s adorable Char–is there anything you can’t do? 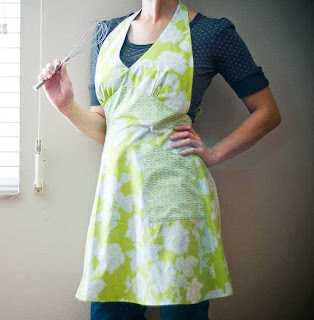 Love this apron, sassy and cute too. How funny that the word verification came up as bread. How crazy is that?